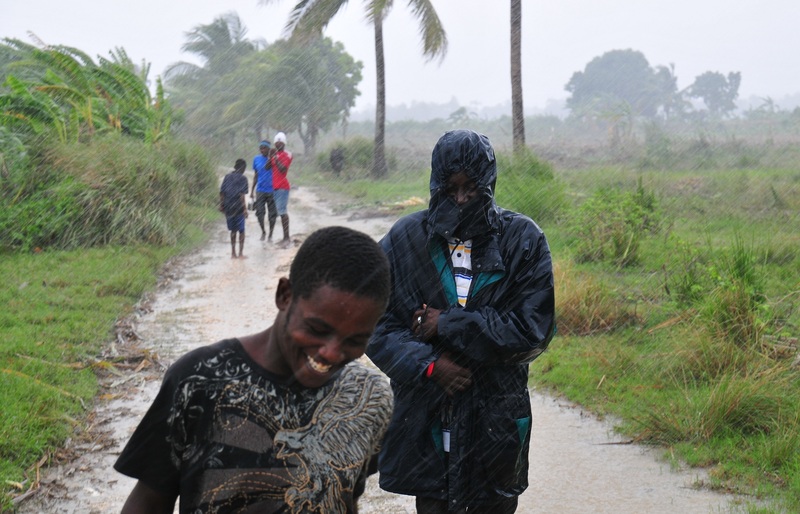 Hurricane Sandy has been drenching Leogane for the past few days. 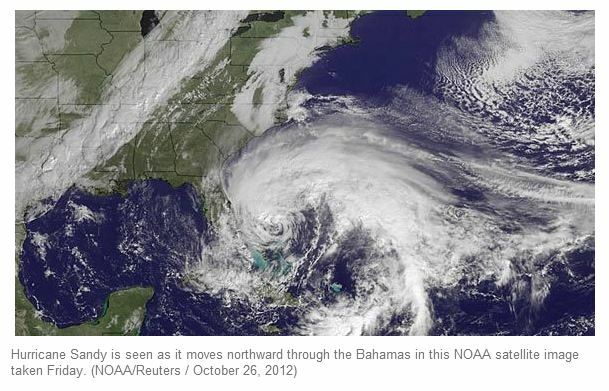 Heavy rains and strong winds have caused widespread flooding, blocked roads, and loss of life and property. Families are evacuating with what they can carry. The damage seems to have exceeded anyone’s expectations, and as I write this, the rain shows no sign of letting up. 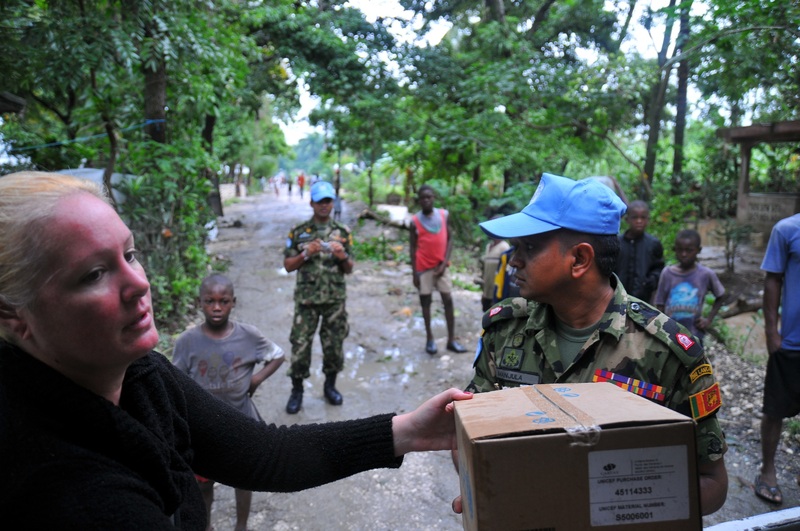 MINUSTAH helped GOALS reach flooded rural communities, where we distributed UNICEF hygiene kits and some bread. The need in these areas remains extremely high, and are getting more severe as the storm continues. GOALS hit the road this morning to visit Carrefour Croix and Destra, which have been hit the worst. There is water everywhere. Rivers, canals and fields that are usually bone-dry are overflowing. 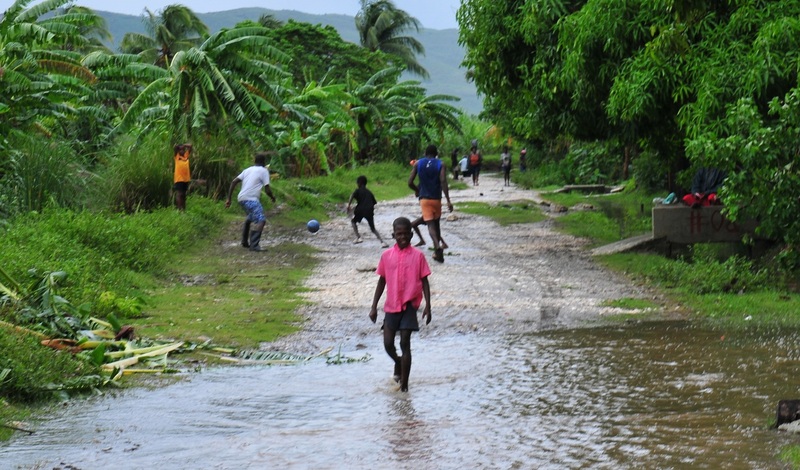 Flash floods are one of the main ways that people die because of storms in Haiti. Because of Haiti’s deforestation, the water is brown, full of top soil and silt rushing down from the mountains. In Destra, the water is chalky and pale from water gushing down from the mountain’s lime quarry. Banks of stream beds and canals have crumbled due to the water’s force. More trees would help with this problem, as the roots grip the earth and help canals stay intact. But the rain and wind are too forceful for many of the trees that do exist; in some places, trees are falling, blocking the roads, and dragging down makeshift power lines. The fields of crops on the way to Destra show the storm’s strength. 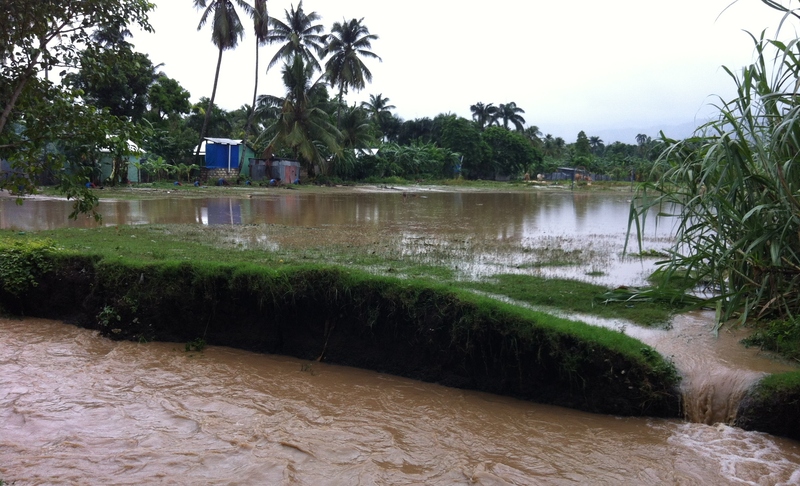 The sugar cane is flattened, fields flooded and banana trees uprooted. The water also carried away goats and other livestock that people depend on. In many places, the road was completely covered in water. We managed to make it through in pick up trucks, but the water came up high above the wheels. Driving around Carrefour Croix, Terasonson and Destra, there’s a lot to take in. A young woman used a small bucket to bail out her flooded home. A little boy catching a fish in an over-flowing stream, and holding it up proudly to show off. In our case, a UN vehicle filled with Sri Lankan soldiers and GOALS’ mixed crew of Haitians and Americans only added to the spectacle. People were grateful for the little help we could provide. Showing up to check in with people and see how they were doing seemed as important as the hygiene kits and food. We walked around to see the damage in Destra, slogging through rain and mud and getting soaked to the bone. Amazingly, the kids struck up an impromptu “animasyon,” and led us around on the visit chanting, singing and dancing. Their enthusiasm was infectious, and I think everyone in our group was thinking about how much we need to help. 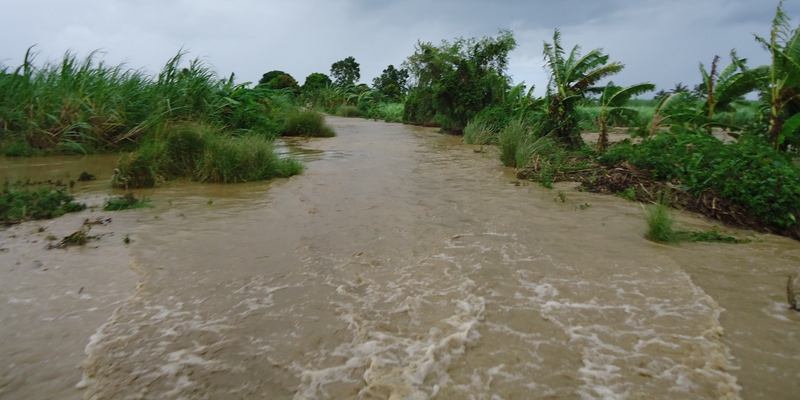 Recovering from this storm will likely be a long process, combining reconstruction, environmental conservation and cholera prevention projects. The work we’ve done in these areas has helped, but there’s a lot left to be done before families aren’t quite so vulnerable to natural disasters. My favorite part of the day happened on a stretch of road on the way to Destra. It was pouring out, the entire road was badly flooded, and I wasn’t even sure if the truck could make it. But up ahead, you could spot children playing soccer on a drier piece of land. They were kicking a ball around happily, running and skidding in the mud, and getting completely soaked. It reminded me of children playing soccer amongst rubble after the 2010 earthquake here, and the reason I started GOALS in the first place. It really is crazy how much children here love the game, but it’s a beautiful thing to see.